This level has hard difficulty and you need to use good technique to complete this level. For this level you should try to play from bottom and eat the honey. 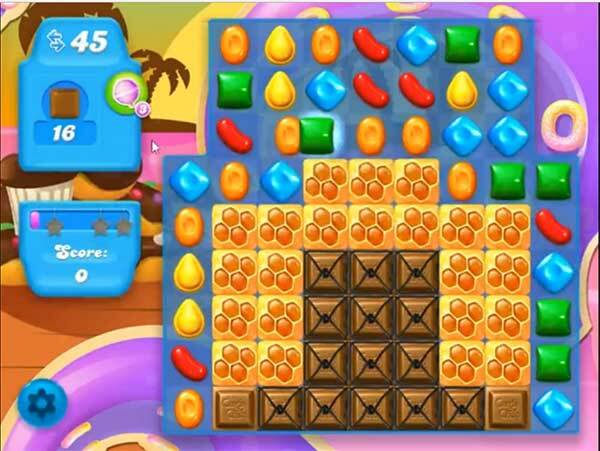 Make colorbomb by combining five same color candies or any other special candy as you get the chance and combine special candies to each other to break more honey and grills. After play near to chocolates to eat them without wasting the moves to reach the target. This was my favorite game until I got on level 110. I have been on it for months, but I don’t play it a lot anymore, because it is impossible. When you think you are doing good and have a great play, the chocolate is there eating it – I noticed the chocolate never eat any in the video, I might win too, if that happened to me, but I don’t even get close. I isn’t fun anymore and I don’t care if I play, as long as I’m stuck on this level. 110 is impossible…not enough board to make special combos. I stopped play also, no longer fun being struck at this level. After reading the previous comments, I don’t feel so bad. I agree – this one has taken the fun out of CCSoda. I’ve read the cheats and will try another few times. If I can’t break through, I’ll be deleting the app and moving on to something a little more fun. i just beat it after 4 tries. It really helped me to read these tips been on this level sometime now! Why do you make a fun fun game so difficult. After a month of wasting money and being charged for lives I never received I am finally quitting soda crush. They are just taking your money and never letting you win. I believe it’s all a scam. Today I decided this is the last day I’ll be play the game. I’ve tried for so long to get thru this level and cant. I don’t know these video walkth us must be on a computer looks like they have more room then me on the phone. Also seems like they get alot of bigger combos and the chocolate doesn’t take over Luke it does on mine. Not just this site but others too. Well it was fun while it lasted, but 110 has ruined that. I decided today would be my last attempt. It definitely is not fun anymore when you spend a month or more with no victory. The above clue of work from the bottom helped me break loose and conquer it today. I tried a couple of times first. I had to CONCENTRATE on the bottom once I reached it through vertical stripe swipes. It is so important to not get distracted to other moves. I kept trying to keep moves as low as possible and experienced more helpful avalanches. It is time-consuming, especially if you don’t win. If you feel your life would be better without it, go for that. If you need victory, I’m only saying it is possible. I will add I used my LAST move to clear the last chocolate – and it was a fishy that ate it 😉 Had no idea chocolate makes fish bait. Good luck! Don’t get frustrated.I always check Candy Crush Mom & app. Tipper ‘s hints only . I completed level 110 on 3 rd try. You forgot to mention 1 important thing. Every tile of honey has 4 colored dots which go away one by one each time you make a combination that touches that tile, so concentrated on 1 tile to get your candy through .